Scott Notes in 2000: Being inside the nomad’s house (ger) was interesting. The outer & innermost material of the ger is canvas, with an insulating layer of felt sandwiched in between, all supported by a collapsible wooden frame. They appear flimsy, but apparently they hold up amazingly well to Mongolia’s fierce winds. The door of a ger always faces south and there is a stove in the middle. On the east side is a small bed/couch and on the south east a small cupboard for storing cooking utensils, jugs, bowls etc. On the west side are small stools or another bed/couch and on the south west a saddle bag and an airag bag on a wooden frame. On the north side is a storage chest with a Buddah on top. The makeup of the ger as described above is, I have been told, standard for every ger. The stove fire is fed with dung, and the dung appears to be quite effective. Thomo Notes in 2006: Scott doesn’t mention the two supporting poles in the centre of the ger. These are used to support the roof (there are 81 large rods that form the roof support – again, I am not sure why 81 – 9 times 9 – the Buddha’s age at death or when he found enlightenment, I don’t know). It is bad form to pass anything between the two poles, cups, plates of food, anything must be passed around the poles. When entering the ger, traditionally, men move to the western end of the ger whilst women move to the eastern end, although I believe this practice is now slowly changing. Scott Notes in 2000: The weight of a ger is approx 250kg and during summer the nomads would move approx 4 times and during winter about 8 to 12 times, or is it the other way around – I cant remember (too much vodka I think). Most Mongolians still live in gers, even in the suburbs of Ulaanbaatar. It’s not hard to understand to understand why. Average income per capita is below US35 per month. Wood & bricks are scarce and expensive while out in the country they call the steppes, animal hides are cheap & readily available. 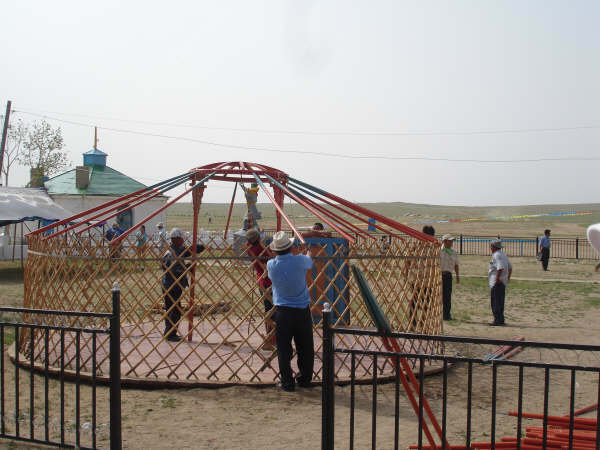 Most Mongolians remain nomadic and gers can be moved easily with assembly taking between 2 to 3 hours. Thomo Notes in 2006: I have watched a ger being erected and it really is done very quickly. The picture attached to this blog entry shows a partly erected ger. On the northern side of Ulaanbaatar is an area known as the ger district. Here folks can grab a piece of land, put their ger up and have somewhere to live in Ulaanbaatar. Unfortunately, in the winter time, the ger district is a large contributor to the pollution in Ulaanbaatar as all those stoves are fueled by wood or coal, creating great clouds of smoke at the time of the year that the wind does not blow much. Scott Notes in 2000: We eventually said farewell to our hosts before taking the long trek home. The drive itself was rather boring as the countryside remains monotonously the same – very, very barren with no trees whatsoever. In some regards it reminded me a lot of certain parts of the Australian outback. Thomo Notes in 2006: There is such a difference in the appearance of the countryside, depending on whether you travel north, south, east or west from Ulaanbaatar. No matter which way you travel, the countryside is just beautiful.